high without bending their knees and perform the intensively impressive "Goose Step March." 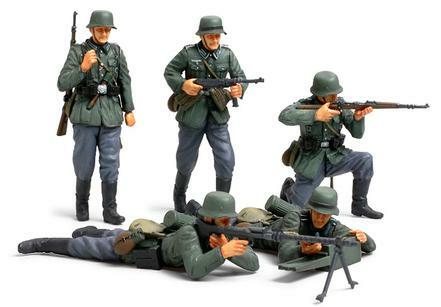 Set includes 5 figures to depict German infantry in early-WWII. A soldier carrying an MP40 in both hands (can also be modeled to hold a rifle). the MG42 are also included). The ammo bearer who is feeding the ammunition from the ammunition case. All five soldier figures come with new helmets (2 of which come with camouflage belts). enable a variety of poses and equipment.